Why would the number two man in Nigeria be flying in chartered flights despite the array of airplanes and helicopters in the Presidential Air Fleet (PAF). And why would the company managing the crashed police aircraft, Caverton Helicopter hastily attribute the crash to poor weather condition even when Accident Investigation Bureau (AIB) was yet to come out with its report. AIB is the only agency saddled with the responsibility of conducting investigation into major incidents and accidents in the sector. These were some of the posers raised at the weekend by some aviation professionals, including, Group Capt John Ojikutu, Chief Executive Officer (CEO) Centurion Security Services, Olumide Ohunayo, the Director, Research, Zenith Travels, Ilitrus Ahmadu,President, Air Transport Services Senior Staff Association of Nigeria (ATSSSAN) and Aviation Safety Round Table Initiative (ART, among others. It would be recalled that the Presidency had said in 2015 that the Presidential Air Fleet (PAF) had 10 aircraft. These are Boeing Business Jet (Boeing 737-800 or AirForce One), one Gulfstream 550, one Gulfstream V (Gulfstream 500), two Falcons 7X, one Hawker Sidley 4000, two AgustaWestland AW 139 helicopters and two AgustaWestland AW 101 helicopters. Some of the jets in the fleet have since been handed over to the Nigerian Air Force to boost its operations. Although they acknowledged the fact that the accident could still have happened whether the aircraft was from the presidential fleet, but accused the presidency of negligence and poor handling of Vice President’s traveling arrangements. Besides, the security arrangement at the scene of the crash was poor adding that more casualties would have been recorded if the aircraft had caught fire, adding that the security personnel should have condoned off the area immediately after the incident. They also faulted the security details at the presidency wondering whether adequate inspections were not carried out by them before they embarked on the travel. According to them, at best, Caverton does not have contract with the occupant of the office of Vice President but the All Progressives Party (APC) campaign group, which should have made adequate provision and taking precautionary measures. 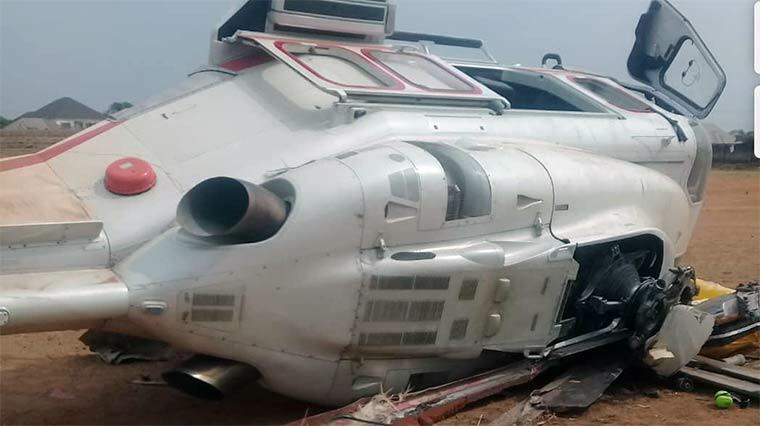 Speaking with Daily Independent, Ohunayo lamented that crew; other passengers and onlookers were too close to the helicopter immediately it crashed in Kabba, Kogi State. He emphasised that there was no urgency to flee the scene in case of fire outbreak, stressing that it was the responsibility of the crew to ensure everyone moved as far as possible from the aircraft, which he said did not happen in the case of the crash. “I suspect fuel was jettisoned because there was no rush by anybody to leave the aircraft vicinity even the passengers were so relaxed,” he said. Ahmadu, said that investigation by AIB would reveal the causes; immediate and remote of the crash, warning against speculations on the crash. Also, Aviation Safety Round Table Initiative (ART) raised the alarm over the poor security management around Osinbajo. ART pointed out that the crashed revealed that the Vice President had a porous security arrangement. ART insisted that it was deeply worried about the preparation made for the landing of the helicopter in that area and the crowd that surged towards the crashed equipment. It said that if the crash had resulted into fire incident, more casualties would have been recorded; stressing the security was not well managed. ART also raised concern over the usage of a foreign pilot to fly Osinbajo, declaring that it was a slap on the huge human resource of pilots Nigeria has in abundance. But the presidency has denied that the pilot was a foreigner, saying they were Nigerians.